Fumigation is an inconvenient process. Discovering you have termites in your Santa Monica, California, home is bad enough without having to also bag up all of your food and medications and leave your home for days at a time. 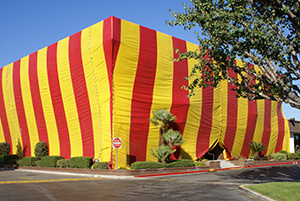 However, many homeowners are surprised to learn that tenting isn’t the only treatment option for termites. At Kilter Termite and Pest Control, we offer a more targeted method that is far more convenient and equally effective. In addition to using a convenient and proven-effective termite treatment system, there are many other ways that Kilter goes the extra mile for our customers. For example, we offer free, no-obligation termite inspections, making it as easy as possible for you to get an honest assessment of your home. We will also develop a treatment plan that is tailored to your residence and have only trained and experienced technicians implement it to ensure effective results. And, once termites have been eliminated from your home, we can even provide wood replacement services to restore areas in your home that have been damaged. Learn more about the advantages of choosing Kilter Termite and Pest Control’s termite treatment services instead of fumigation for your home in Santa Monica, CA. Contact us today.